Here comes the volunteer of the month for the month of May - Jyoti Bhat!!! 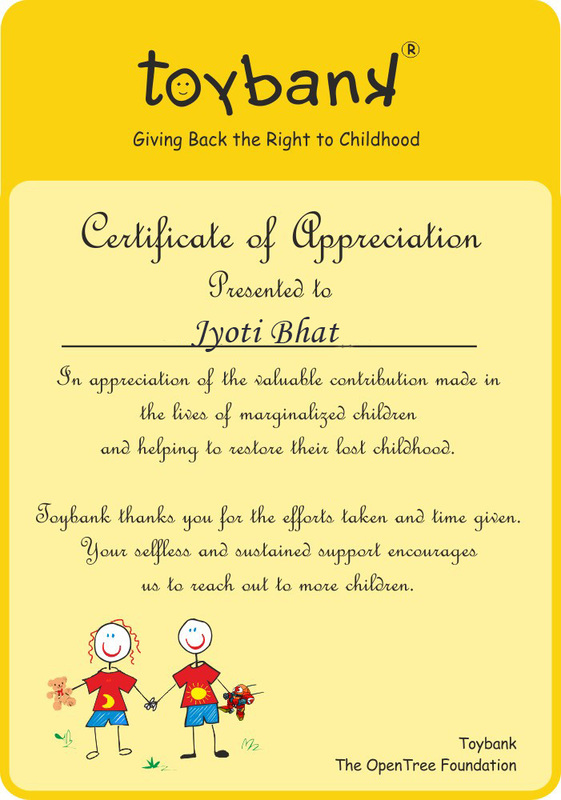 Jyoti has been a Toybanker since 2010, and has been a consistent and dedicated volunteer since then. 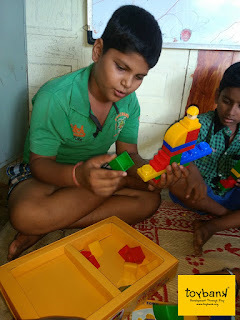 Jyoti has given Toybank invaluable feedback on out events and activities and has participated with her whole heart and soul while interacting with kids and other volunteers. Jyoti, its been wonderful to have you as a volunteer. We hope to take you along as Toybank goes miles across the city and the country achieving its vision of a happy and a healthy childhood for all children. My first event was, at Don Bosco grounds in Nov 2010- 'The Children's Day Mela'; and first meeting with Farnaza (the connect to Toybank) was at Dadar for understanding the games to be taken to Don Bosco. Then some wrapping sessions and toy sorting at Kaymo, Mahalaxmi. Toy distribution at girls home Udaan Ghar along with a creative session. The opening of the to library at the Rajawadi municipal school. The Toybank Summer Bash where I got to revisit my origami skills - it is one of my hobbies, but I had not done it for quite some time. EVERY event was interesting and I learned so many new things at each event and in the interaction of the children. So frankly the knowledge sharing and the happiness is mutual :) between us volunteers and the kids. I did do a couple of other volunteering activities related to children. 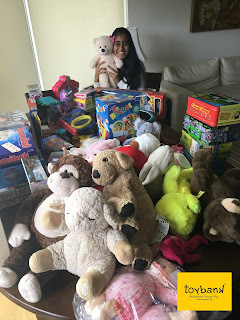 But what I like about Toybank is that it is quite well organized - it has now so happened that I anticipate every month end for Farnaza's monthly schedule of volunteer opportunities to choose from! And then the Toybank get-together, held recently, was really worth it - it gave face to some of the names seen over mails, it felt good to find people from so many walks-of-life associated with Toybank. And it showed every person is still a child somewhere - and toys are seen as an integral part of childhood. There are fond memories of some particular toys from our childhood. And the learning through toys in a playful way is retained for a longer time! Volunteering is what was earlier referred to as "Shram-Daan" - where one 'donates' time and effort / skills for the overall betterment of the society without a lookout for personal gain. But I believe volunteering is a Win-Win situations where there is eventually mutual benefit. That - I think - is the 'ulterior motive' ;) :D in 'VOLUNTEERING'." Thank you once again Jyoti!